In preperation for the new Spring & Summer collections, Emellie are having a 20% off sale. Just type in 'Sale' in the coupon code box on checkout, and the 20% will be deducted. Today is the last day to get free UK delivery on orders over £15, and a free gift for overseas orders at Hijab Fashion Shop. Modern Mary are giving 20% of all purchases to the IRUSA’s Children in Need campaign. You will also receive a $15 gift certificate with each purchase. Offer ends 18th February. Zeena are offering free shipping with any order this weekend. Just enter the code love at the checkout. Alnisa Hijabs have a new range of Silk Look Oversize R-T-Y scarves. iLoveModesty have recently launched a range of exclusive handcrafted jewellery products, designed and made in Canada. 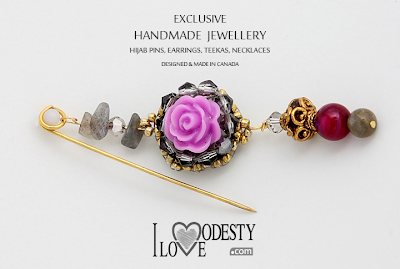 Does anybody have the contact email address for the iLOveModesty website? I'm struggling to access their website, an error keeps popping up so I'd like to send them an email. modernmary has awesome items. i especially love their jewelry. thanks for the heads up!